The DC Universe is expanding, in both the fictional and real worlds. We recently spoke to co-publishers Dan DiDio and Jim Lee about what fans can expect in the near future. 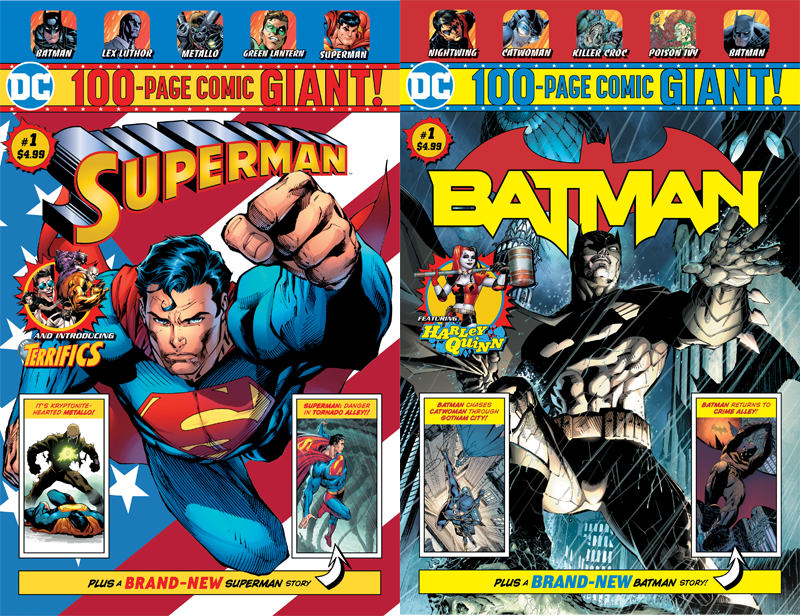 The publisher’s new imprints DC Ink and DC Zoom are aimed at building out offerings for two tiers of younger readers. 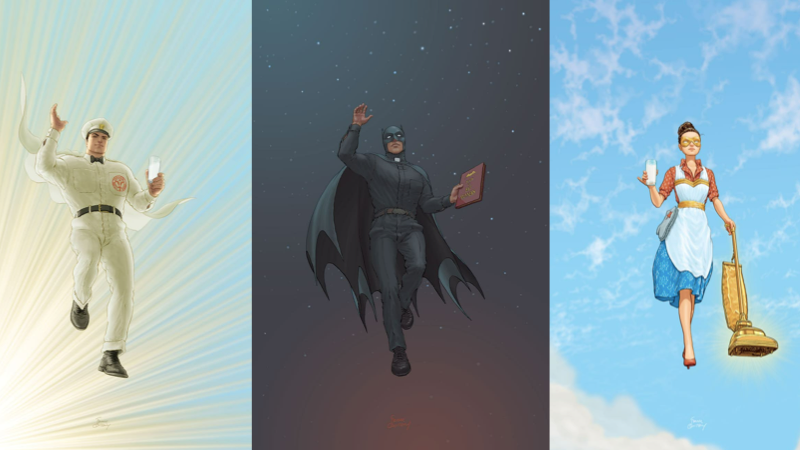 DC Black Label is assembling some of comics’ best creators to tell single-volume stories that stand apart from the company’s 80-year publishing history, in formats designed to tap into the bookstore market. This autumn, the DC Universe streaming service will bundle back-catalogue comics, community hubs, and all-new TV shows together on one platform, at least for US-based fans. It’s notable that all of these decisions are for initiatives happening away from the comic shop ecosystem. The network of stores that sell comics is still important to DC, but DiDio and Lee want to continue pushing their heroes into new horizons. When I spoke to DiDio and Lee at San Diego Comic-Con, they discussed the challenge of evolving how they tell and sell stories. What follows is an edited and condensed version of our conversation. You guys are throwing a bunch of different initiatives out there, aimed at putting comics in different places and in front of potential new readers. The sense that I get listening to you guys is that what DC Comics is competing against has changed. What would you say are the things you’re pushing against in terms of the future of this company? What’s the competition now? And how are you trying to match, steal, or exceed what they’re doing? Jim Lee: I would say that it hasn’t changed so much for us, in that when Diane Nelson put together DC Entertainment, there were different things that we wanted to focus on… I think it’s natural for mainstream comics fans to see this competition between Marvel and DC and use our sales on the Diamond charts as the barometer of who’s ahead and who’s behind. But that only paints—I’m not going to say “small”—but that only paints a partial picture of the overall business, for us. And we’ve been cognisant of that since day one. We’ve always measured ourselves on a number of different metrics. We pull in, obviously, our mass market sales, our individual issue sales, and we look at other opportunities for growth. So I think our competition has always been ourselves, what we achieved the year before, and what still remains to be done. We realise comics are still really not a mainstream market business. We don’t see a lot of uplift when a movie goes out and sells a ton of tickets. We see the lift on the collected editions side, but the periodical business seems to be unfazed by that. So, why is that? Are there ways to, again, solve the Rubik’s Cube and come up with a solution to this? So I think those are the things that we grapple with and challenge ourselves with. Dan DiDio: It’s funny, there’s a lot of what Jim said that I agree with 100 per cent. The interesting thing about what’s changed is that comics used to be a counterculture business. And now it’s a pop culture business, which is counter to being counterculture. So comics was once a way to attack and create material for people who felt disenfranchised, and now it’s being embraced by everyone. How do you go back to the core of what comics are and remain relevant, while a lot of people are getting their interpretations of our stories and characters from other mediums? It’s important for us to constantly reinforce and reinvent and stay innovative. And again, we’re a print medium and it is a mature business. But we still have to show a high level of innovation—probably more than anything else to make sure that we remind people of the relevance of our characters and where the source material and inspiration came from. Dan, you said something in your talk that struck me—“We used to do it really well.” I imagine “it” was bringing in new readers with the 80-page giants, 100-page giants. What do you think has changed to make that a vulnerability? DiDio: I think a lot of things changed. I think the material matured with its audience. You know, I always use the comparison between Harry Potter and The Simpsons. And we’ve turned our stories and characters into Harry Potters, meaning they’re ageing up with the fans. When you look at The Simpsons, the audience aged out and went through and the next age [group] came in and they went through. That cycle constantly replenishes your audience because you’re going after very particular demographics rather than ageing up with it. Once you start to age your stories up, you start to get more insular in what you create because you’re speaking to a very particular fan base who’s been with you from the beginning. And as that thing gets smaller, it becomes less inviting for the people who come in. So what we’ve got to do is find a way to rebuild our base, and I think we did a good job of that when we did New 52. We got a lot of new voices in here. Where we failed is that we didn’t maintain edicts in New 52 to remain fresh and new, and then we started to fall back into old habits, and then we became neither fish nor fowl. Not for a new audience, not for the older audience. Rebirth was built to reestablish the foundation of the current fan base, but we need to find ways to reach out. But now the tastes, and the way that younger readers read might be different. They might not be as interested in the periodical comic that we create, but they are interested in the graphic novels. That’s why we’re going after the young adult audience. That’s one way to do it. The trick will be, once you get those kids, to see whether or not they will come over to periodicals. It’s also about finding a way to create periodicals to bring them into the main line, too. And that’s what [putting our comics in] Walmart is about. I have a daughter who’s seven, and she’s all into DC Superhero Girls. Single issues aren’t enough story for her. She’s like, “When’s the next one? A MONTH? !” And I’m very excited about DC Zoom for that reason, just because she’s going to have more stuff to read. But speaking about those imprints, as you’ve been talking to your creators working on those books, how different can they be? You talked about maintaining consistency instead of continuity, so like, how different can they be if you still have that end goal of bringing them into your periodical business? Lee: I think that’s what we’re going to find out. You look at Melissa de la Cruz, she’s doing a take on a Batman in high school who’s half-Asian with a Catwoman who’s Latina. I think what’s exciting about this is, you know, it’s the iconic characters, but they’re not exactly the same. You look at the Truth & Consequence Jack Hyde story, it’s Aqualad and it’s a gay coming-of-age story. These are different takes than what we have done traditionally in the mainstream books, so, I think it’s exciting that fresh voices are coming in at the material from a fresh pair of eyes. I think that is part of the renewal process when you’ve had characters who’ve been around for 80-plus years The way you keep them contemporary is to continue that experiment Dan was talking about. At DC, we talk about how indestructible these characters are, and we really do believe that so we shouldn’t be hesitant about pushing them in new directions and seeing what really cool things come out of that kind of experimentation. We’re not just doing it in the YA line. We’re constantly pushing all our creators to do things that haven’t been done before, because, I think there’s nothing that upsets us more when we are constantly doing backward-looking homages to stories from decades ago. Right? We want to honour the past by blazing new trails going forward. That’s the motto. DiDio: I just want to reiterate one thing Jim said, which is really important. The homages are all well and good but the problem we’re in now is that everything is still in print. So you could always go back to the original material, the source of this all, and you could see it told in its purest form. If you’re doing watered down versions of the original, all you’re doing is comparing to something it can never be better than. You guys talked about Young Animal as a pop-up imprint. Does Vertigo being resurgent cancel out the idea of doing more pop-up imprints? Yeah, no, I wasn’t trying to conflate the two. The question was more in search of a definition of a pop-up imprint. You need it to be anchored by a sensibility or a person? Lee: We’re going to announce another pop-up later today. You’re referring to Geoff Johns’ new imprint? Lee: I think that was in the press release. DiDio: We have other ones we’re looking at as well. And in some ways The Sandman Universe books are, in theory, a little bit of a pop-up from Neil Gaiman. DiDio: I never expected an actual wedding. Lee: But you knew what was going to happen! There was a sense of betrayal or bait-and-switch, on the part of some readers. How can you address that in a way that doesn’t necessarily make people feel like they’re taken for granted? Lee: They did? Whenever I read wedding issues as a kid, it was always framed as a question of “will it happen or not?” Like, “villains allowing our heroes to live in happiness? Is that something that could possibly happen?” And that was some of the feedback we were getting from the fans before the issue even printed. Either “oh my god, it’s going to kill me if [Batman and Catwoman] don’t get married,” or “there’s no way it will happen.” So, I felt like other people shared that same “would it happen or not” sensibility. It’s like an issue [where] we say two characters are “fighting to the death,” right? You’re setting up this expectation, hyping up this story, and then the purpose of reading it is to find out what happens. Right? DiDio: Yeah, I mean, I have a couple opinions on that. You asked about us taking the audience for granted; actually, if you want to be perfectly honest, I think the audience took the story for granted. For me, it’s about the journey. To explore the issues in the story. We’re not as interested in a married Batman. We’re interested in a story about a Batman who is anticipating being married, trying to live a normal life. We constantly go back to the Batman family, the level of tragedy that’s been thrown at them and what drives them. The most interesting thing that I heard was that, [some fans] wanted the wedding to happen because they wanted Batman to be happy. I understand that but, to me, a happy Batman is the end of Batman. Our story is about the drama and the challenges he’s facing, and I think there’s no greater story about a hero—about someone who puts his own personal interests aside in order to move on and help others. That’s the hero’s journey. Batman’s our greatest hero in so many ways. And it’s important for him to understand that, and he’s constantly putting the tragedy of his parents’ deaths as a motivating force and a driving force, where he puts the life of Bruce Wayne aside. We got a glimpse of his [future] life for a moment and a chance to see what it might look like. But the reality is, married Batman is an Elseworlds Batman, to me. You know? They did that in Earth-2. We’ve done these stories. And people who anticipated that all said the same thing. Did you really think Superman was going to stay dead after Superman #75? Where’s the challenge there? So, my standpoint is that, I think that Tom has a really long plan for Batman, he really does have a hundred issues figured out. And this is just part of that journey. And it’s a turning point. That’s what’s important. And a story is judged, not by how that story is told, but how it affects future stories. And the future stories because of this moment I think are going to be much stronger because of how this issue played out rather than any other way it was going to be told. io9: Do you know where he’s heading, where the endpoint is? DiDio: I know where it is. We’re still trying to figure some of the pieces out, but we know the basic arcs of where this is. io9: Issue #100. I mean, issue # 103, which Tom King is saying would be the last issue of this mega-arc. The last page. Do you know what that is? DiDio: I have an idea. But you know what? What’s great about the creative business is that you have something that you’re pointing to, but the journey is really interesting and sooner or later the characters start to tell a story for you. And Tom’s one of those kind of writers. He’s following the path of the character. Those things evolve and change. There was a point where Catwoman wasn’t going to run into Bruce, and then all of a sudden, she does. And these things just evolve, because you see where the potential is. And again, that story creates potential, not limits. That’s why, from my standpoint, [Batman #50] reads as the logical conclusion of that art of the arc.